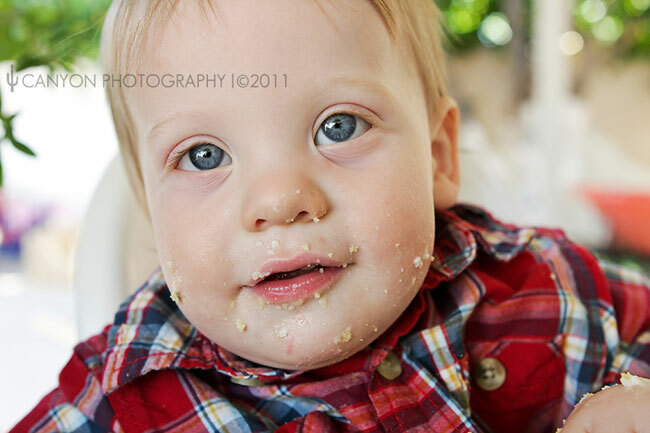 Country Western party: Max is 1! To create rustic signs on the cheap, Adrian took inexpensive balsa wood planks, stained them with wood stain, and added text with a white paint pen. For a finishing touch, she hot glued rope trim around the edges. The backdrop behind Max’s printable banner is actually brown craft paper from the dollar store, with wood stain that was “ragged” on to create a leathery look. 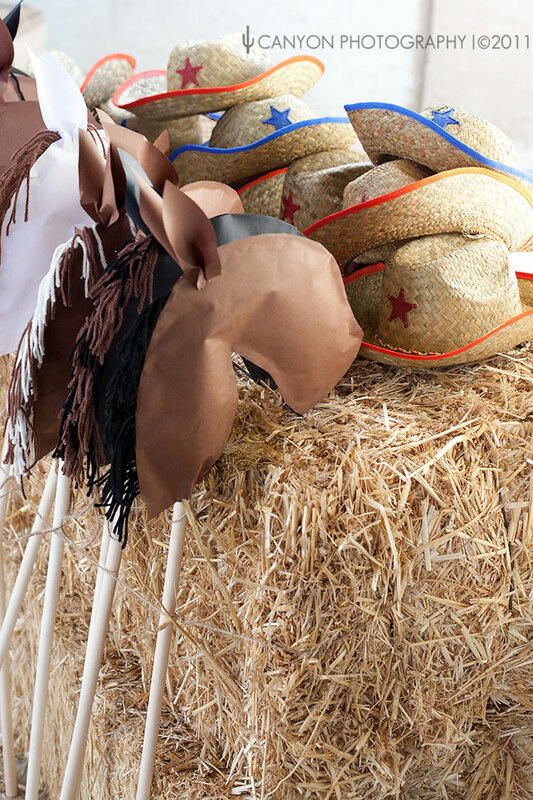 The cowboy hats used throughout the party are from Oriental Trading. 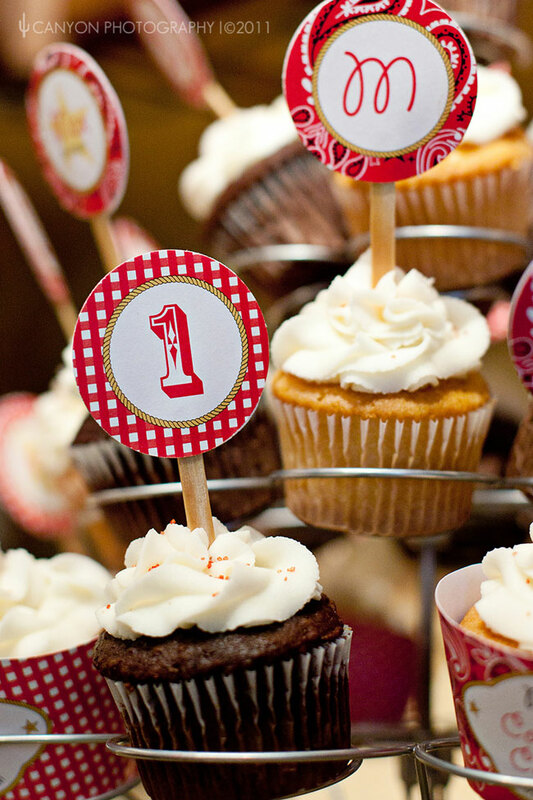 The printable cupcake wrappers and toppers are from Chickabug. Farm hands were treated to yummy finger foods, including “haystacks” (recipe here) and “honey wheat ropes” (actually pretzels), plus lemonade and a flavor-your-own milk bar. Each dish was labeled with a printable buffet card. 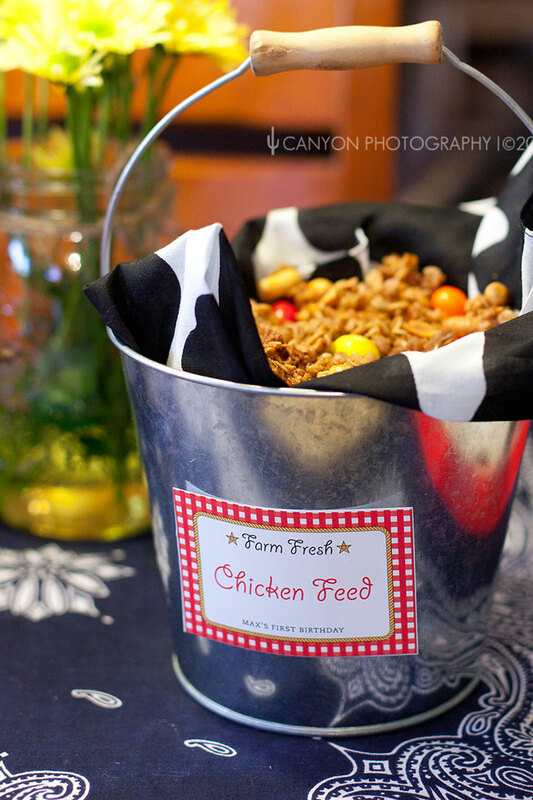 “Chicken feed” is the cutest thing! It’s actually a granola mix with peanut M&M’s added. In addition to being a fabulous photographer, Adrian also makes a heck of a cake! She made Max’s large cake as well as all of the cupcakes. To make this adorable farm bowling game, Adrian used clip art from Scrappin Doodles. 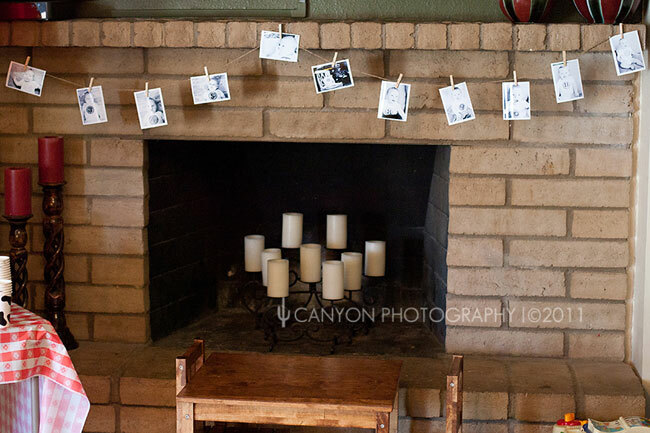 She printed the clip art onto card stock, laminated each character, then attached them to liter-sized soda bottles that were each filled about one-third full of sand. 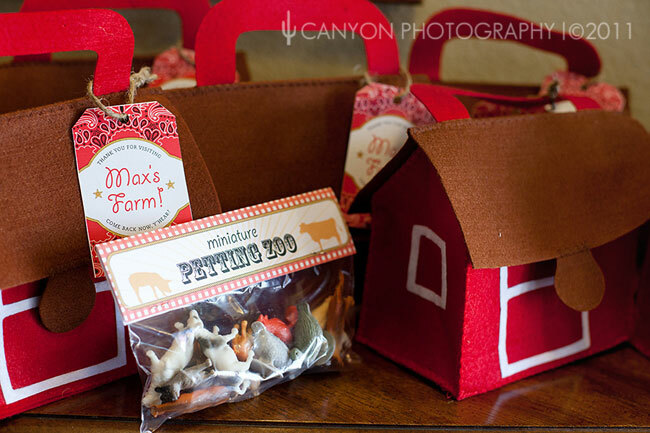 Each guest went home with their own miniature petting zoo – how cute is that?! The felt barns were a bargain from the Target dollar aisle. The cutest lil’ farmer in all of Arizona. : ) Happy birthday, Max! Thank you so much, Adrian! 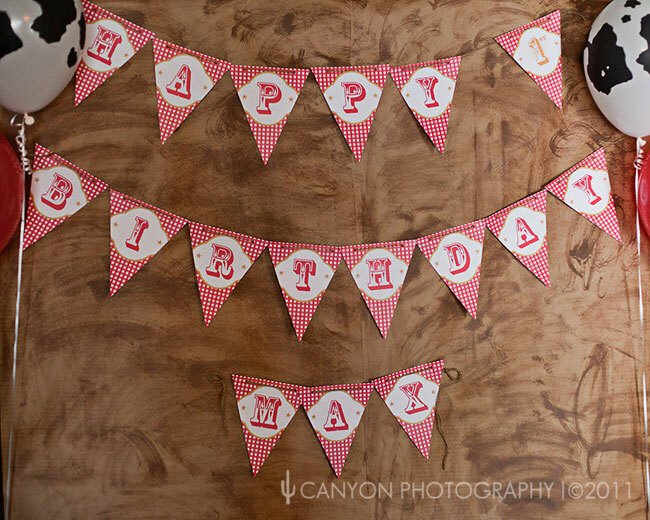 Shop for personalized Country-Western Theme party paper goods and printables here. 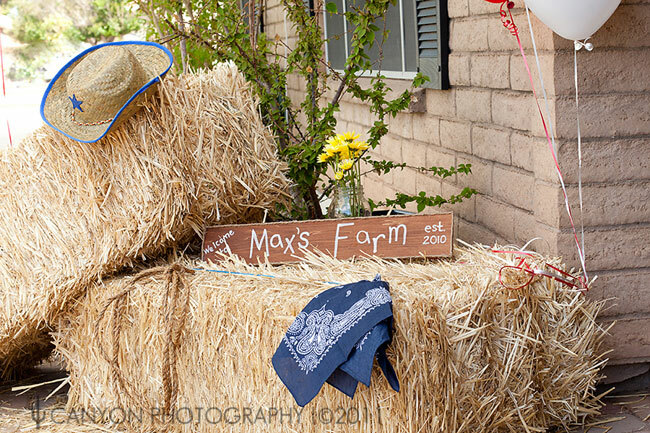 Or, check out more Country-Western Theme party ideas on Pinterest or here on my blog! Such a cute party! So many great details. The stick horses are my favorite! Thanks! 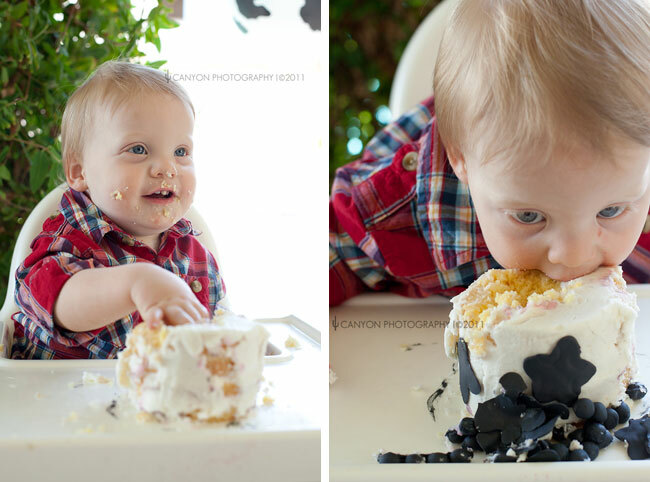 I am totally borrowing that idea for Cate's party! Love the bowling too! Perfect for toddlers! Thank you for sharing. Love this theme! I am doing a western theme for Cate's 2nd birthday. Love the wreath.. Can you link up the vendor or tutorial? Thanks, Christina! : ) Though wouldn't you know that the wreath was the ONLY thing I didn't bug Adrian for details about?! I wrote to her to ask about it. I'll let you know what I find out! UPDATE! Adrian said, "it's a straw wreath form (I left the plastic on) and I ripped 1-2" sections of red bandanna fabric. 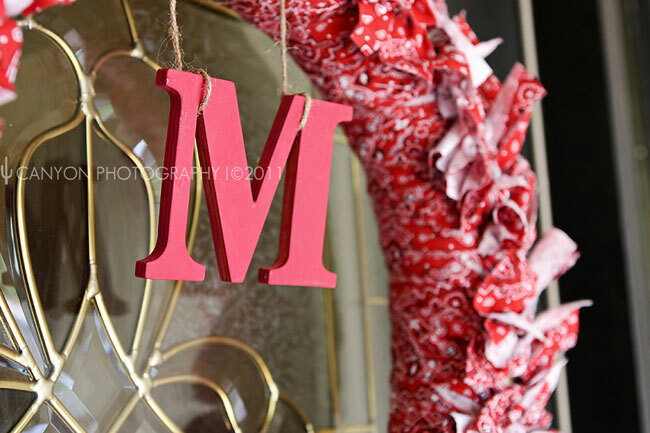 I double-knotted the strips around the wreath, then tied on the red 'M' for Max with rope. Easy peasy!" What a cute party! 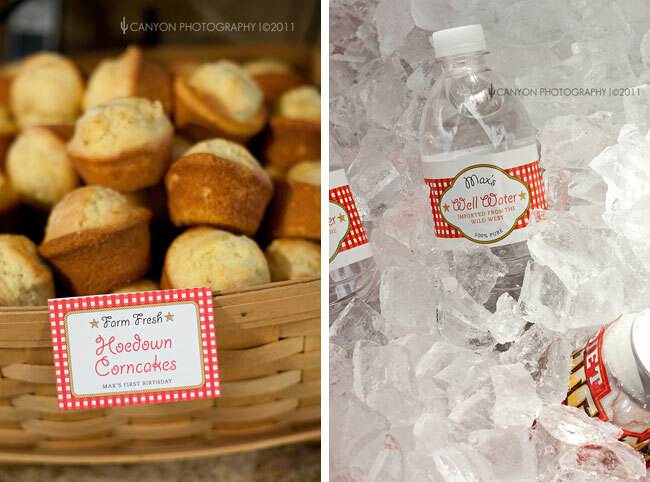 Love the DIY milk bar and the farm bowling! I just saw your party on pinterest and had to come over and read all about it!! 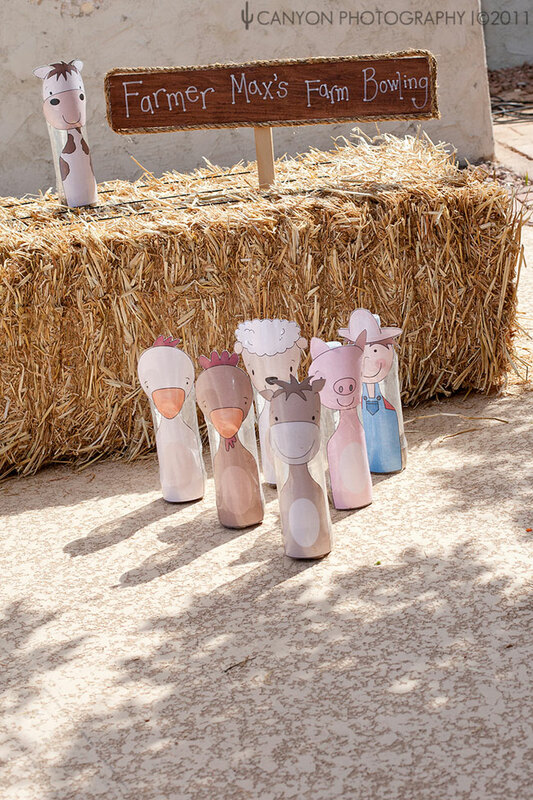 I love it...and the stick horses are adorable!! Heather what a fun party! 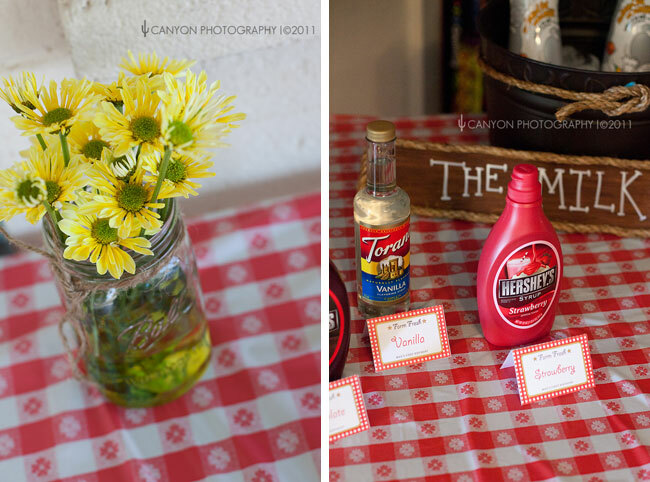 i stumbled upon your blog while searching "Country theme parties" and love what you did with the event. My son is about to turn 1 and even though our theme will be Toy Story, I really want to concentrate more on Woody's cowboy side. Thank you for the inspiration! Thanks Yesenia - you're so sweet!! I'm glad you found some ideas here. 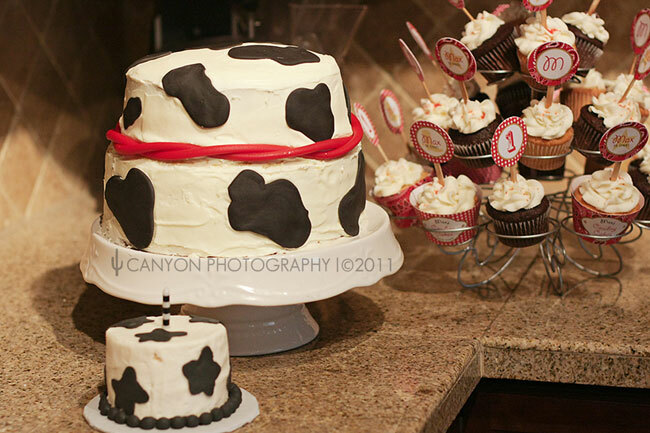 : ) I *adore* Toy Story - I hope your son's party is wonderful! Love the stick horses! I tried making one last night and it didn't quite look like yours. Any tips you could offer? It took about an hour to do one, so I'm wondering what I'm doing wrong. Thanks!! Came across your blog while searching for cowboy party ideas. My son will be turning 2 and love all your ideas! So many great ideas. And the sweetest lil cowpoke! Thanks!! 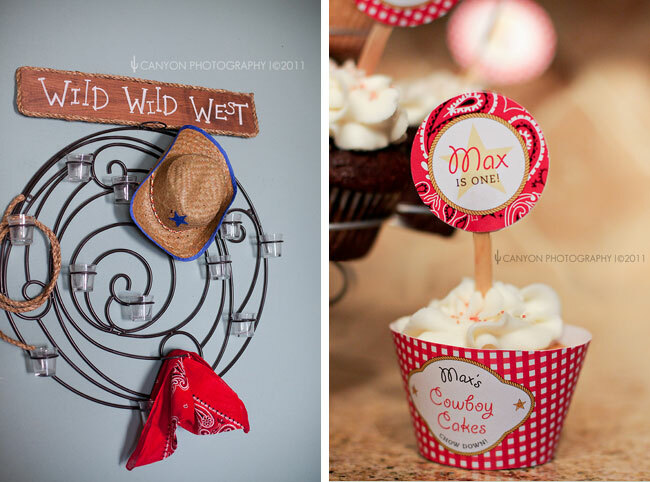 This party is so adorable, and the country western touch is the perfect theme for a first birthday party! 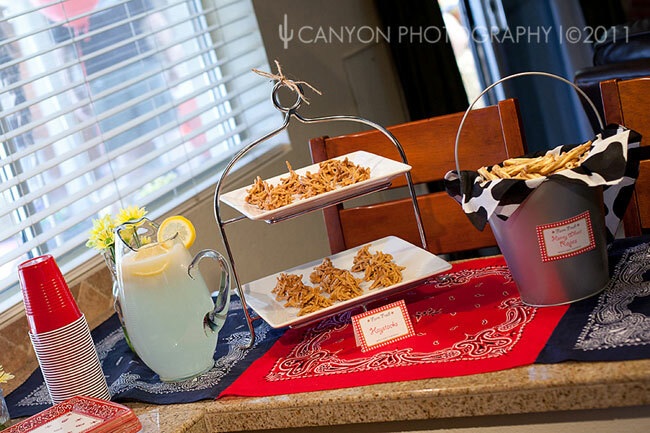 I love the bandanas and the cowboy inspired food and décor! Thank you for sharing your affordable ideas – the printed banner is too perfect! Hi Heather! Where did you find the miniature petting zoo and also, what did they bowl with?